SAW032180 SCOTLAND (1950). 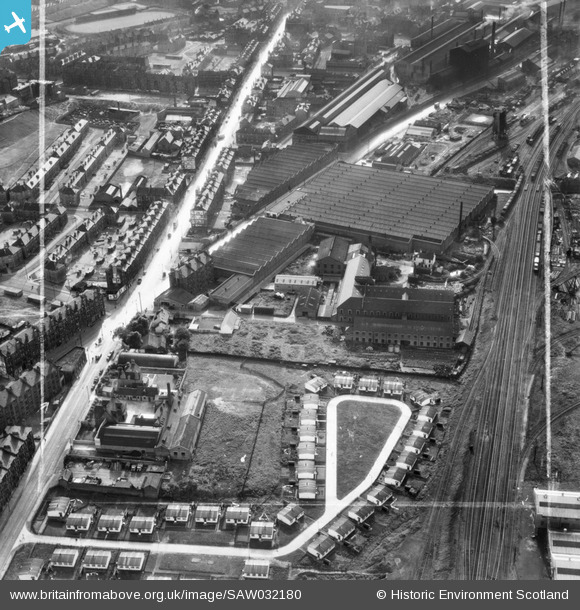 Glasgow, general view, showing British Dyewood Co. Ltd. Carntyne Dyewood Mills, Shettleston Road and Westmuir Street. An oblique aerial photograph taken facing west. This image has been produced from a crop marked negative. Title [SAW032180] Glasgow, general view, showing British Dyewood Co. Ltd. Carntyne Dyewood Mills, Shettleston Road and Westmuir Street. An oblique aerial photograph taken facing west. This image has been produced from a crop marked negative. Quarrybrae School annexe/dinner school with janitors house in background. Parkhead Picture Palace (Three P's) ~ 1953. Bowling Green at Southbank St, apparently there was a bowling green round about here at some point. Advert for Parkhead Wash House opening. What sits here at 2019 ~ Steam Hammer on Shettleston Road. Mural that adorns this "gable end" as at 2019. According to this map I think this may be Parkhead Jnrs. first home ground somewhere roundabout here. Tollcross Rd at Sorby St. Lighting Department, used to store elevator vehicles and where the on foot workers skivved off to for a wee fly cuppa tea. Ward’s Bar, now demolished was known locally as ‘the daft shoap’ and reputedly had peever beds painted on the floor, and a horse is said to have drank beer at the bar. This pub was originally called William Craib.The locals called it Craib's. Forresters, played in here as a kid. Full of armoured cars, WWII gas masks and the occasional Grenade ! O'Kanes Bar : A crowd stand outside O'Kane's for the opening of the new refurbishment which took 3 months for the modernisation in 1974. As 'clippedwings' quite rightly pointed out on 7th December, these trucks are not AEC Matadors but Fordson Thames 7V tipper trucks. I couldn't remove or edit my initial post so have put this in to clarify. Thanks. I think that they are Ford 7V's. Compare the position of the headlights, the slope of the radiator, the cab tapers in plan view and the one piece windscreen. Grier Street. No longer exists. Afraid you're wrong with this one, that's actually Beattock St.
Parkhead Forge, Duke Street, Glasgow This works was founded in about 1837 by Reoch Bros & Co to make forgings from scrap iron. It was subsequently greatly extended by Rigby & Beardmore and William Beardmore & Co Ltd. During both World Wars it was an important munitions works. This shows a large machine shop built in 1905 and extended in 1914 to make artillery for use on the Western Front during World War I. The brick cladding covered a steel frame. The main part of the works was at the far end of this range. Under William Beardmore, Parkhead Forge became the nucleus of a vast industrial empire, with a workforce of over 100,000 at its peak. By the 1960s Parkhead was all that was left, making alloy steel, heavy forgings and rolling-mill rolls. The works closed in the 1980s and has almost all been demolished accept this one building (see pic) which today trades in spare car tyres. Source: RCAHMS contribution to SCRAN. This shows part of the forge on the north side of East Wellington Street, from the south-east. This is 'F' machine shop, probably built in the 1890s, and a heavy machine shop used when built to machine gun barrels and other large steel forgings and castings. Beardmores became the largest munitions works in Scotland during both World Wars. After World War II the firm made, among other products, forged boiler-drums and work rolls for steel strip mills. The works closed in the 1980s, and most of the site is now a retail park, known as The Forge. This very large complex had its origins in a forge established in about 1837 by Reoch Brothers & Co to make forgings from scrap malleable iron. It was subsequently enormously enlarged by a series of partnerships, and under Sir William Beardmore became a major munitions works from the 1890s. Source: RCAHMS contribution to SCRAN. Crail Street, named after the village of the same name in Fife, originally known as Baird Street named after Robert Baird an oil and colour merchant. 65C Parkhead Motive Power Depot coaling tower and yard. In 1902 a Miss Jenny Brown lived here. Her father owned a licensed grocer's at 213 Westmuir Street. Information obtained from old postcards and post office guide.